Determination is defined as firmness of purpose. Determination is that positive emotional feeling which involves proceeding towards a difficult goal, despite obstacles. Determination serves to motivate behaviour that will help achieve one’s goal. 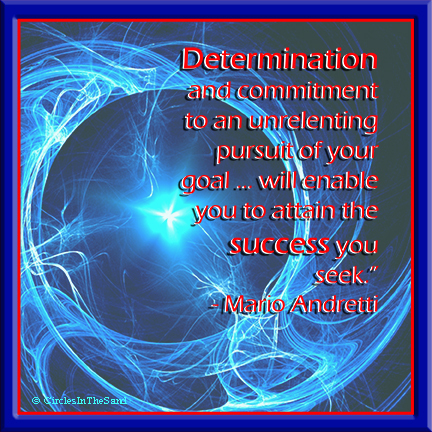 Determination is the pre-cursor to goal attainment. To be successful at any activity, one should follow a series of steps. First, have the desire to achieve. Immediately followed by motivation to be on the top. To do so, one needs determination. And to get this determination to work, we need passion. Passion is strong and barely controllable emotion. It is pure energy. This is the energy inside each of us. It is this energy that gets blocked when we resist change. When we are not prepared to change our thinking. When we do not own responsibility for our own well-being. When we lack self-esteem. When we react rather than respond to situations. When we suppress feelings. And when we are comparing and criticising. We do not realize that not expending energy itself consumes energy. In other words, remaining at the same status (being static) will also use our energy. Determination is the positive emotion that pushes individuals toward action, that results in important outcomes such as diligence and perseverance, and the development of constructive coping mechanisms. Acting with determination also boosts physical health and mental well-being. Specific positive outcomes include illness resistance, increased survival rates and decreased levels of depression. An individual experiences positive personal growth when they are able to proactively cope with a difficult situation. In such a case, an individual can acknowledge a demanding situation, take action and maintain high coping potential. One can acknowledge the benefits of a difficult experience yet display a willingness to put forth an effort and achieve specific personal goals. It is very hard to move on, but once we do move on and with determination, we will realise it was the best decision we have ever made.